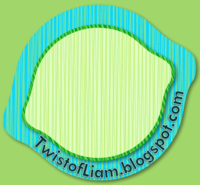 Teaching with a Twist of Liam: Clutter-Free Week #3: What have I gotten in to??? I went in to my classroom on Tuesday. I was so stoked. I had my camera, I had my rules for dealing with the clutter, and I had my plan of attack. You wouldn't believe how quickly I got to step 3. ...The trouble was I skipped Steps 1 and 2. It took nearly an hour before I even made it to my classroom. There was such a buzz of excitement amongst staff who were so happy to see each other after the summer holidays, that it was virtually impossible to not give in and start handing out hugs. Regardless, I eventually made it into the room and did my best to stare down the shelves. A wall-to-wall shelving unit filled haphazardly by a team of unfocussed and unmotivated eleven year olds can hold an AWFUL lot of stuff. 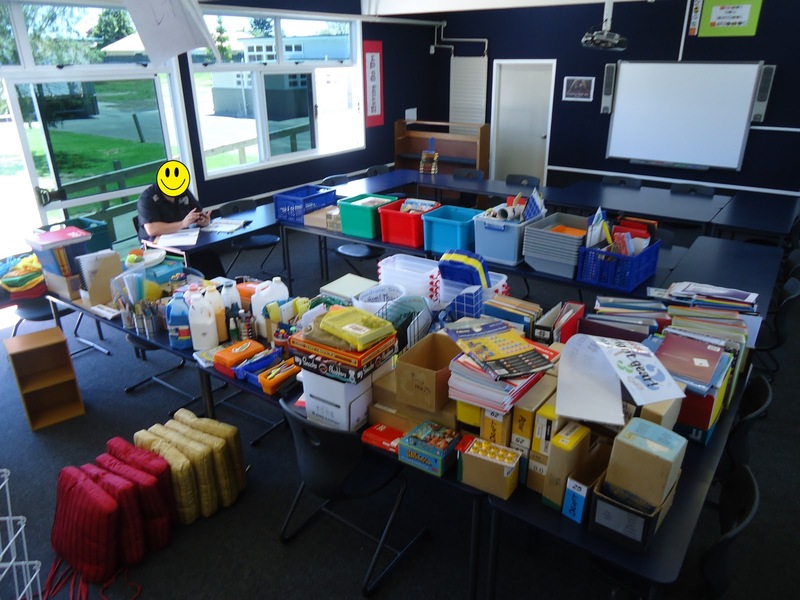 I thought if I just gave it The Look (you teachers know the one I'm talking about), the clutter might sort itself out. No such luck. I guess, as a third year teacher, that's one more thing I will have to work on. Alright then. We'll do this the HARD way. That's code for manually and autonimously. That's code for I pulled absolutely everything out by hand. 1pm rolled around and here I was. No, that's not me smiling. That's a teacher buddy that is about to start his first year. I was multitasking (that's sure to earn me SOME points, right?) and helping him get himself sorted as I tried to do the same for myself. But this is what came off shelves and what I faced this morning when I returned. The magic elves did NOT show up, despite leaving out cookies and shotglasses of Starbucks, so I had to deal with it myself. Not fun and not done (and the clock isn't working either). But the shelves have been cleaned and I got started on refilling them. Tomorrow's mission is to get the rest of the mess off the desks, start thinking about displays and try to catch up with Jodi's mounting pile of tips and tasks. All in all, I'm feeling good about this mission. I don't suspect I will ever make it to the "hall of tidy-fame" (where all the awards are level, aligned, alphabetised, and colour-coded) but it's better already. And that's why I joined in in the first place. Not to add to your pressure to get organized, but you're about to get some visitors. 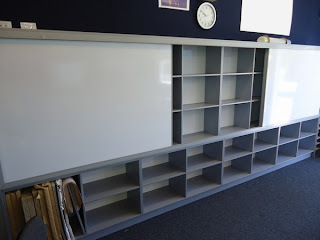 I can't help but feature you on Clutter-Free Classroom today. You're awesome and others will benefit from your enthusiasm and sense of humor. As I read your comment, I couldn't stop the words "oh, dear" from escaping my mouth. Not a fan of pressure but I really appreciate the feedback. I guess I should tidy up if I'm expecting company! Shut up Liam! Even your clutter looks organized. I have to say you are so smart to organize it as you removed it from the shelves. It looks so "clutter free" sitting on those tables. I am so jealous! You should see my mess at the start of the year. On the same note, but slighlty different, I can't help but admire your space. I know it will be fab. I am not surprised that Jodi is featuring you on her blog today. I have uncluttered my desk, and will post about it tomorrow, I hope. I've been trying to write it all week and just keep getting side tracked. Thanks! I guess I never thought about it that way. It just kinda happened. The room is slowly taking shape and I think it will be pretty neat looking. I'm back in to get the rest tidied up and start in on my desk. Good luck with your own adventures in de-cluttering. I look forward to following along. OMG- I would KILL for that much shelving! So.Very. Jealous! I'm a new follower! Your classroom is to die for! I love the dark walls and shelving. That's the most organized pile of clutter I've ever seen. I would gladly accept payment in the form of Starbucks... surely you have friends who feel the same? I'm a new follower. Love your wit. Oh my word, Liam, I CANNOT get over how gorgeous your room is!! And the built-in storage. I can only dream of a room like that. Wow. That's all I can say.